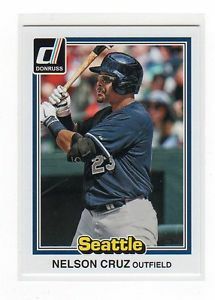 During the offseason, the Seattle Mariners signed Nelson Cruz to a lucrative four-year contract after his excellent season in Baltimore in 2014. Cruz is among the leading right handed power hitters in baseball – something that Seattle has been sorely missing for a long time. The Mariners fell just a game short of the playoffs in 2014, and they were counting on Cruz to be the added punch in the middle of the lineup that they needed to put between All-Stars Robinson Cano and Kyle Seager. So far, Cruz has delivered on those expectations, and then some. In just 13 games, Cruz has already logged eight home runs for the Mariners. There was some concern that the expansive Safeco Field would put a damper on the home run totals that Cruz could post, but that simply hasn’t been the case so far. He has been homering both at home and on the road, and already has 16 RBI to his credit. It has only been two weeks, but the Mariners have to be thrilled with the early returns on their investment. While Cruz will always be known mainly for his power, the early season hot start has included more than just homers. He is hitting .358 currently, and getting on base at better than 40%. Perhaps even better news for the Mariners is the reasonable strikeout numbers found on his stat line – just 10 k’s in 57 plate appearances. Cruz is never going to be a contact hitter, but keeping that strikeout rate at a reasonable level will be key to maintaining his productivity. Just as it was imagined in the offseason, the 3-4-5 combination of Cano, Cruz, and Seager is already causing problems for opponents. In a game against the Rangers, Cano came to the plate with first base open and the winning run standing on third. Rather than giving Cano a chance to win the game, the Rangers chose to walk him and pitch to Cruz with the bases loaded. Cruz singled to left, and the Mariners won in walk-off fashion. There was no great option available to Texas in that scenario, because of the middle of the order quality that the Mariners now have to offer. As a team, the Mariners aren’t off to a great start – due mostly to sub-par starting pitching. However, Nelson Cruz has certainly been doing his part to boost the offense of a team that has long struggled to score runs. If the starting pitching in Seattle can return to its form from previous years, the Mariners may be the team to beat in the West.